Once again the end of the month brings the excitement of Reveal Day for us members of The Secret Recipe Club. For those who don’t know what it’s all about, the club pairs two food bloggers in secret, and on reveal day everyone posts their recipe of choice. I was assigned the blog Turnips2Tangerines, hosted by Lynn, from Wisconsin. Lynn’s site is a very sweet spot, with many recipes centered on all things dessert, but you will also find plenty of savory dishes to drool over. She also publishes a monthly feature called Culinary Adventures, where the cooking of a particular country is highlighted through a menu and recipes. Very nice, check her latest post on Sweden by clicking here. 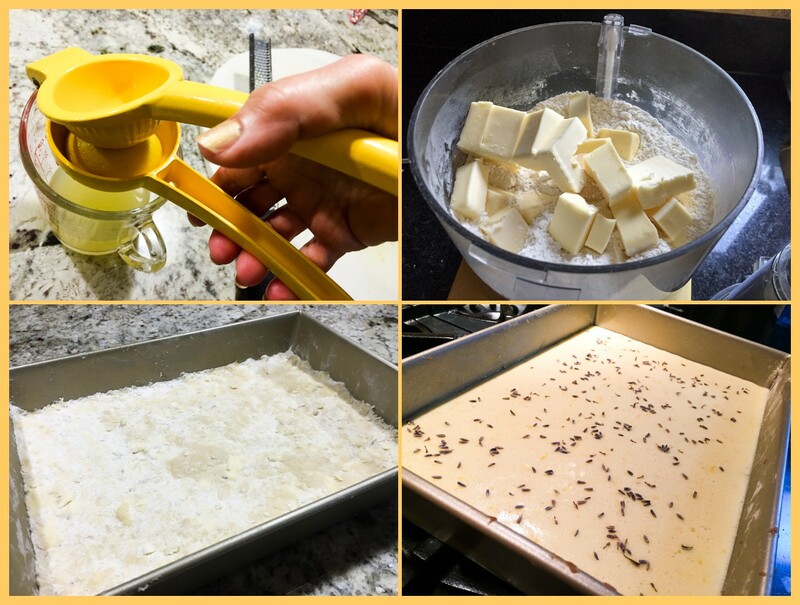 In a bowl combine flour, confectioners’ sugar and lavender; cut in butter until crumbly (I used the food processor). Press into an ungreased 13 x 9 x 2 inch baking pan. Bake for 20-30 minutes or until lightly browned. Make the filling by beating the eggs in a bowl until frothy. Stir in lemon juice and peel. In another bowl combine the sugar, flour, and baking powder. Stir into the egg mixture, mixing well with a whisk. Pour over baked crust, and sprinkle lavender over the top. Bake for 25 minutes or until set. Cool on a wire rack, cut into bars. If you want, sprinkle confectioner’s sugar before serving. Comments: Yellow might be one of my favorite colors, so it’s only natural that I always have plenty of lemons in the fridge. Plenty. I cannot imagine cooking without them, even savory dishes. Lavender is another flavor I am fond of, but of course it needs to be in small doses, it’s easy to have it overpowering a dish. In these bars, the amount of lavender was just right. I decided to use the food processor for the crust because I felt that the lavender would be better dispersed throughout the crust by doing so. After processing, I dumped everything on the counter and made sure the flour was all coated with butter, no big spots of dry flour remaining. It is also important to try to spread the crust as evenly as possible, so that it browns at the same rate in the oven. I almost managed to do that, but one corner ended up a bit over-baked. No major harm done, though. Lynn, thanks for a lovely recipe, and I hope you had a great time with your assignment this month! For my readers, you are all invited to browse through the goodies made by my fellow screters from group D. Just poke the blue frog at the end of this post, and have a blast! I most definitely will visit the blog. I’ve made Martha Stewart’s Chai cupcakes and they were/are fantastic! I opted for a Mocha frosting combo. Oh heck, now I’m drooling. Hand me a few lemon and lavenders, please. yes, the chai cupcakes are calling my name! seems amazing to me! I’ve never tasted lavender in anything … sounds lovely. Ooh! I have some of that lavender just begging to be used. These look very tasty! I’m glad they made your meeting much more palatable. Lemon bars are a summer must make. These look extra special with the lavender. Great SRC pick! I have been craving lemon bars for weeks now… these look SO amazing!! Me too… in fact, the last time I had a lemon bar was while we were living in LA and I made some to take to that lab…. sweet memories! I love, love, love all things lemon too. These would be a big hit in our house. You do have the luckiest students! I have a day full of meetings today and these would certainly brighten my mood! Nice to see you here! Yes, the right amount of lavender makes it all shine! Thank you again for a great recipe! Yum, lemon and lavender are such a great combination! These bars look delicious! It has been so long since I have had anything lavender. I will definitely need to try these. Lavender is the type of flavoring we don’t consider that often, but I think spring and summer are perfect for using it. Hello! I am visiting from Wendy’s blog A Day in the Life on the Farm. These bars sound wonderful I am a fellow Kansas blogger living in Hutchinson. My son attended college in Manhattan but later transferred to KU where he graduated. Hello there! Welcome to the Bewitching… so nice to “meet” you! A fellow blogger from the same state! We are newcomers here sort of, but love it! Oh I’ve never cooked with lavender before, but I bet this smells and tastes heavenly!! I am going to have to get me some culinary lavender. It has been showing up in a lot of recipes lately and this one, especially, has gotten my attention. I sometimes open the bottle just for the smell… in our home in Oklahoma we had a HUGE lavender plant that did very well, survived several winters. I wish we had transplanted it here. My lemon squeezer is orange but I don’t think that indicates any preference for color because it was on sale at a closing down sale. I love culinary lavender in baking as long as it’s not too overpowering. I would love the lemon and lavender combination. This recipe is AMAZING! My mouth was watering from the title and I think I lost my mind when I read about the Chai Spice Cupcakes and the banana bundt… I love finding recipes that I can get all the ingredients in Australia. Thanks for sharing! Oh yum! These bars look fantastic! My husband doesn’t like lemon in baking so I never make anything with it, but these look too good to pass up! Oh, that’s too bad about your husband being the anti-lemon… it is one of my favorite things! 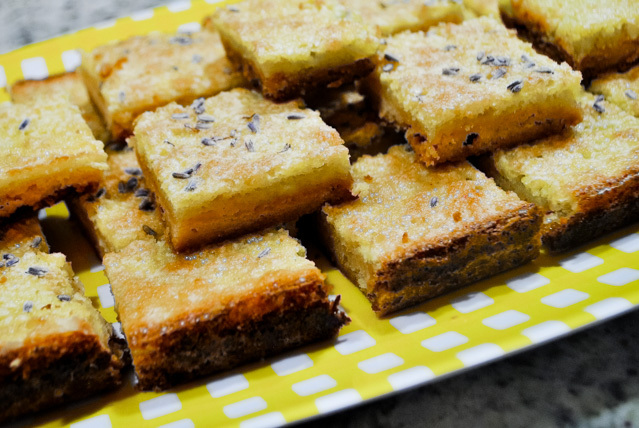 I love a good lemon bar – one of my favourite kind of treats – and I am especially loving the inclusion of the lavender in this version. Great choice. Glad you enjoyed it! I think lemon bars join the right amount of acidity with sweetness – love them! These sound positively divine. I love using lemon in everything too. Can I be invited to your lab meetings? Although Monday mornings sound brutal…I can barely survive our Monday 4pm meetings. Looks like we need sweets at all meetings!! 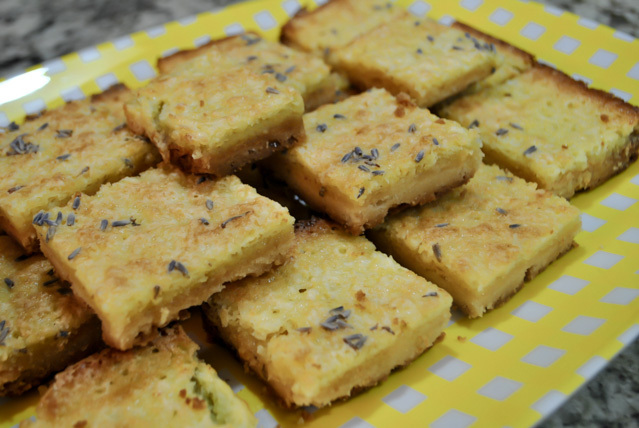 I love baking with lavender and this combo with lemon in the bars sound amazing!! Looks great for a nice afternoon tea treat! Exactly! These bars would be welcome at many points of the day, brightening them all up! Never cooked with lavender before. Very cool. I bet these were lovely!